Before I get to my second Dampier Solution, I want to throw one more possible option into the “Waive Him” category. Last week we heard from NBA.com’s David Aldridge that the Bobcats were trying to get involved in the Houston/NO/NJ/INDY four team trade. The ‘Cats wanted to squeeze yet another team into the mix (the Raptors) in order to send Dampier’s expiring contract to the Pacers for the Rap’s Jose Calderon. Aldridge is and has been a top notch NBA beat guy for decades so I’ll take him at his word: The Bobcats are still interested in acquiring Calderon. Here’s the thing that I don’t get: Jose is at best an overpaid part-time starter for the Lottery bound Raptors. At worst he’s a salary cap albatross who’s paid like a top 10 point guard and will probably start the season on the bench behind the average Jarrett Jack. So why are the Bobcats trying to trade a real deal asset (Dampier’s immediately expiring contract) for him? The answer, of course, could be that the front office is clueless (and there are many signs that undeniably point that way) or perhaps this is just a smokescreen leaked by Toronto management in order to try to raise Calderon’s value throughout the League. If in fact the Bobcats are interested in Calderon then why not offer up a more palatable combination of Gana Diop and D.J. Augustin? Diop’s contract matches Calderon’s in length with Jose due around $6 million more over the next three seasons. Sure, Gana hasn’t done a damn thing to prove he’s worth the League minimum (much less a full midlevel) contract over the past year but he’d be the biggest body on the Raps thin roster and he’s still young enough (28) to contribute. Meanwhile, D.J. would add another shooter and speedster to Toronto’s open court game. He’s also an expiring contract or a cheap trade chip if the Raps don’t want him back after next season. On the surface, Diop’s deal would be hard to swallow but I’m not sure if Toronto will see a better offer for Jose and his 3 years, $30 million than this one. For the Bobcats, the trade would be a solid double. Calderon has his flaws and is flagrantly overpaid but a combination of Jose and Livingston at point guard could work. Both players have size (Jose is listed a 6’3″) and Calderon’s shooting will come in very handy when Shaun struggles with his perimeter shot. Diop’s absence (combined with the eventual waiving of Dampier and loss of Tyson Chandler) heightens the team’s need for depth at center. With Shaq signing on with the Celtics for a little over the League veteran’s minimum, I can’t see a 36 year old Erik Dampier walking away from a two year $6 million dollar offer from Higgins & Co.
Ironically, taking on Jose’s $30 million would help the Bobcats with their financial situation. By unloading a bad deal for a bad deal, the ‘Cats could solve their point guard depth while staying safely under the League’s tax number. The team would still have another two million dollars or so to pickup a street free agent or veteran via trade for depth (see Ratliff, Theo) this year and be around $9 million under next season’s tax line. But if I’m Rod Higgins and MJ, I don’t stop there. It’s time for a double down. In what would be perhaps the League’s biggest two player trade (on a pound for pound basis), the Bobcats could then ship Boris Diaw (recently spotted doing a Biggie Smalls impression at the World’s) coupled with Eduardo Najera to the Knicks for “Disorderlies” body double Eddie Curry. From a talent perspective, this is a coup for the Knicks. Sure, they’d have to sacrifice $11 million in cap space for next season (even with Diaw and Najera on the roster, they’d only have $33m committed) but D’Antoni would reunite with one of his favorite players from his Phoenix days and Boris, when in shape, is one of the most uniquely skilled players in the League. The reason the Bobcats make this trade is to clean up their books for next season. Curry’s $11 million deal expires next summer and the ‘Cats would go into the 2011-2012 season (if there is one) $11 million under the cap and nearly $20 million under the tax line. In the event that Eddie Curry gives a crap about continuing his NBA career, I can’t think of a better place for him than Charlotte. Teaming with Mohammed and Dampier, Larry Brown will utilize Curry’s low post scoring in ways that D’Antoni’s system can’t. Pairing Curry with an athletic power forward who operates from the perimeter like Tyrus Thomas or Derrick Brown would also help. 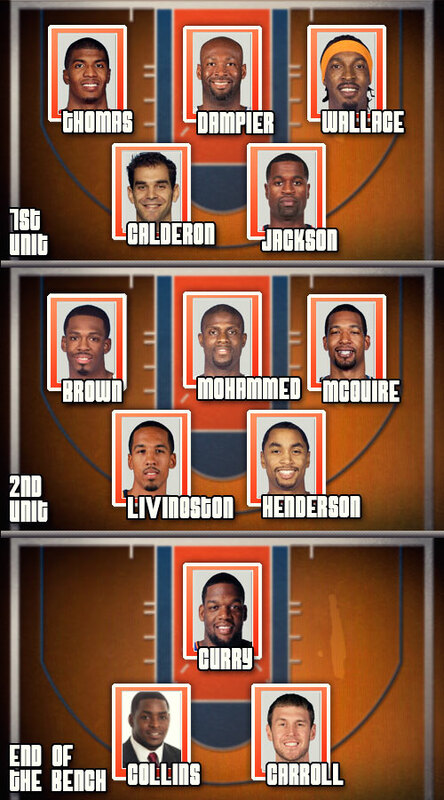 Ultimately, this roster isn’t going to win the Conference Finals. They could however push the team a few games up in the standings and make a run at the Second Round while giving the organization some breathing room to make some moves and build the team while remaining competitive for the next three to four seasons. Michael Jordan bragged openly last month that the team had acquired the League’s “most valuable contract” when they sent bust Tyson Chandler to Dallas in return for Erick Dampier and a couple of overpaid 12th men. How valuable exactly? MJ and GM Rod Higgins will have at least another month and a half to mull over the decision as they wait the mandatory 60 days before Damp, Eduardo Najera or Matt Carroll can be traded again in a package. So what will they do with all of this “value”? In order to answer the question, we need to first look hard at the team’s present situation.